This choice board can be used to review genetics vocabulary with students. Words such as heterozygous, homozygous, dominant, recessive, allele, gene, and more are covered with this choice board. This a GREAT check for understanding to see where students are in mastering their academic vocabulary. 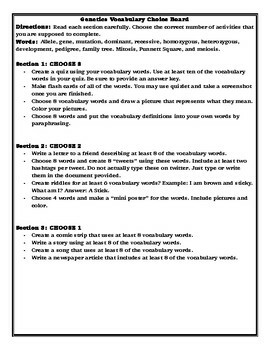 It also gives the students a choice in which tasks they use to demonstrate mastery of content. A preview of the first section of the choice board is provided as a preview. There are two more sections in this choice board that have the students complete more in depth tasks.